Die cast cars were originally designed in the first half of the 20th century as children’s playthings. But the children grew up, and some of them decided to keep and collect those old toys… thus creating a collecting boom that’s still going strong. Focus on a line that interests you the most, for example a specific brand or type of car. Start with the traditional and most popular scale, the 1:64. 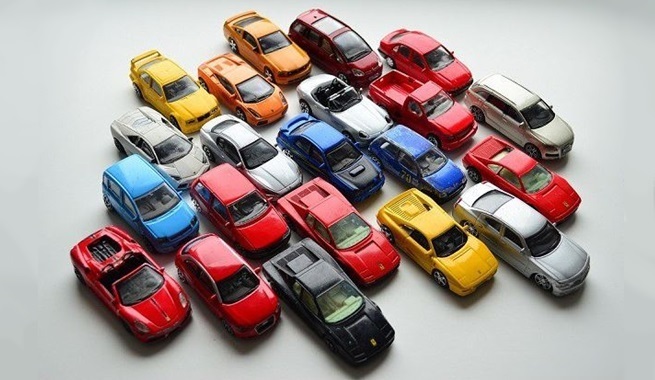 Die cast cars become more expensive as they get bigger, and they can go to the scale of 1:18 or even 1:12. Buy the latest die cast cars you are focusing on as soon as they are released. Die cast cars are relatively inexpensive when first released, but their value appreciates quickly! After establishing a decent collection of standard models, you are ready to go after those highly-accurate, limited-production beauties with many moving parts… and, more likely than not, steep price tags. When you buy boxed die cast cars, you will be faced with a tough dilemma: to open or not to open? The answer to that question depends on why you buy model cars. If you buy with the intention of reselling when the value appreciates, keep them in the original packaging. If you want to enjoy your collection to the full by holding the pieces and viewing them from all sides… you know what you have to do. A good way to avoid getting a headache is to buy in twos: one to keep and one to open. One unusual subgroup of collecting die cast cars is focusing on error pieces, the models with mismatched wheel treads, defective labels, and casting or paint errors. New collectors should be aware that their die cast models require care and maintenance. Whether opened or left in retail packaging, they should be kept at room temperature, in a relatively dry environment, and dusted regularly. If you are taking your model out of the box, apply a coat of wax to the body and then simply use a damp cloth (or a microfiber cloth if the car has decals) for dusting. Re-waxing is usually needed only once every five to ten years, though a single coat of wax can last a lifetime if the pieces are housed in a proper glass display case. To clean the interior of your out-of-the-box die cast cars, use a can of compressed air and spray approximately 15 centimetres from the opening. Be careful not to overdo it, because this can cause condensation in the car. You should also be aware from the outset that a die cast collector never completes his or her collection. New models of cars are constantly being released, prompting you to always expand. Or you can start an entirely new collection in a subtopic, focusing in turn on passenger cars, sport cars, vans, construction vehicles, service vehicles, and so on. Keep on collecting and keep browsing the bidorbuy die cast section for new pieces!